Less than a mile from the lakefront, the Hilton Milwaukee is connected to the convention center via sky bridge. If you're looking for a great (and cheap!) hotel in Milwaukee, CheapTickets is the best place to find them. We offer deals on the best 185 hotels throughout Milwaukee. No matter what you're looking for, we have options for you. Grab great rates on the 66 affordable 3-star hotels that are easy on the wallet without sacrificing comfort. Looking for more luxury? Try one of the 15, 4-star hotel accommodations in Milwaukee. No matter your budget needs, we've pulled out all the stops to make sure you have plenty of vacation options. Maybe you prefer to search for your hotel deals based on what each hotel offers? For example, let's say you just want to find a hotel or resort that has a pool to cool off in after a long day exploring Milwaukee. Scroll down to choose from the 126 hotels in Milwaukee that has a pool for guests. Or search for deals on Milwaukee hotels offering free wifi or breakfast, non-smoking rooms, and more! CheapTickets is here to be your personal travel agent for your next trip to Milwaukee. Get booking today! What hotels in Milwaukee offer free wifi access? Best Western Executive Inn, a 2.50 star hotel in Milwaukee that offers free wifi access for guests. La Quinta Inn & Suites Milwaukee SW New Berlin, a 2.50 star hotel in Milwaukee that offers free wifi access for guests. Comfort Suites Milwaukee Airport, a 3.00 star hotel in Milwaukee that offers free wifi access for guests. 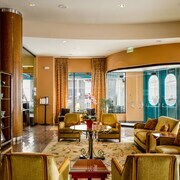 Holiday Inn Hotel & Suites-Milwaukee Airport, a 3.00 star hotel in Milwaukee that offers free wifi access for guests. Are there deals on Milwaukee hotels offering free breakfast? Yes! The only thing better than finding a great deal on a cheap hotel in Milwaukee is finding one that offers free breakfast. Grab some eggs, a waffle, or some healthy oatmeal before a day full of exploring Milwaukee and all that it has to offer. Below are just some of the many hotels that offer free breakfast in Milwaukee. Country Inn & Suites by Radisson- Milwaukee Airport- WI is a 2.50 star rated hotel property in Milwaukee that offers free breakfast. InterContinental Milwaukee is a 4.00 star rated hotel property in Milwaukee that offers free breakfast. InterContinental Milwaukee room rates start as low as $175.00 per night. Days Inn & Suites by Wyndham Milwaukee is a 3.00 star rated hotel property in Milwaukee that offers free breakfast. Days Inn & Suites by Wyndham Milwaukee room rates start as low as $76.00 per night. Wyndham Garden Kenosha Harborside is a 3.50 star rated hotel property in Milwaukee that offers free breakfast. 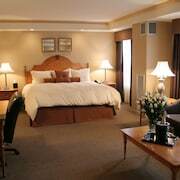 Wyndham Garden Kenosha Harborside room rates start as low as $125.00 per night. What about deals on pet-friendly hotels in Milwaukee? Milwaukee is a great place to get outside and explore with your pets in tow so don't leave your furry friends behind. Below you'll find great deals on hotels in Milwaukee that allow pets. Don't forget to bring plenty of treats! 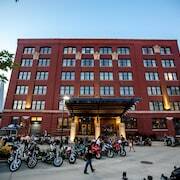 The Iron Horse Hotel is a popular, pet-friendly, 4.00 star hotel in Milwaukee. Room rates start as low as $332.00 per night. Red Roof Inn Milwaukee Airport is a popular, pet-friendly, 2.00 star hotel in Milwaukee. Motel 6 Glendale-WI is a popular, pet-friendly, 2.00 star hotel in Milwaukee. Travelodge by Wyndham Milwaukee is a popular, pet-friendly, 2.00 star hotel in Milwaukee. Any good rates on Milwaukee hotels with restaurants? Absolutely. Don't want to deal with planning our all your meals on your trip to Milwaukee? We don't blame you. Keep the hangry away by staying in one of the 61 hotels that have restaurants. With a room at one of these spots, all it takes to get a good meal is hopping in the elevator. Check out some of the most popular hotels in Milwaukee that have restaurants below. Book Courtyard by Marriott Milwaukee Downtown Courtyard by Marriott Milwaukee Downtown is a 3.00 star hotel and has one or more restaurant options. Book The Knickerbocker on the Lake The Knickerbocker on the Lake is a 3.00 star hotel and has one or more restaurant options. 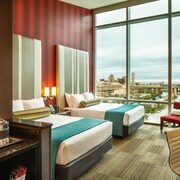 Book DoubleTree by Hilton Milwaukee Downtown with nightly rates starting as low as $227.00 per night. DoubleTree by Hilton Milwaukee Downtown is a 3.50 star hotel and has one or more restaurant options. Book Marriott Milwaukee Downtown Marriott Milwaukee Downtown is a 4.00 star hotel and has one or more restaurant options. What are the cheapest hotels in Milwaukee with pools? What's better after a long day exploring Milwaukee then a relaxing dip in a pool? Finding the Milwaukee hotel you need for a bargain! Cool off and unwind at one of our 126 Milwaukee hotels with a pool. Browse some of the top deals on these hotels and resorts with pools in Milwaukee below, but be warned: You may not want to check out! Hilton Garden Inn Milwaukee Downtown has a pool and a 3.00 star rating. Aloft Milwaukee Downtown has a pool and a 3.00 star rating. Holiday Inn Pewaukee - Milwaukee West has a pool and a 3.00 star rating. GrandStay Hotel & Suites Milwaukee Airport has a pool and a 2.50 star rating. What hotels in Milwaukee offer parking for guests? Once you've made your way to Milwaukee, the last thing you want to deal with is finding parking close to your hotel. Avoid the hassle of parking around the block and carrying your luggage all the way to the lobby by booking one of our hotels with parking. Check out deals on some of the 143 hotels in Milwaukee that offer parking for guests. Residence Inn Milwaukee Downtown by Marriott This hotel has a 3.00-star rating. La Quinta Inn Milwaukee Airport/Oak Creek This hotel has a 2.50-star rating. Hilton Milwaukee City Center offers parking for guests and has room rates as low as $156.00 per night. This hotel has a 4.00-star rating. Hyatt Place Milwaukee Airport offers parking for guests and has room rates as low as $110.00 per night. This hotel has a 3.00-star rating. Do Milwaukee hotels offer 24-hour concierge services? When you're on vacation, things don't always go according to plan. Travel with peace of mind when you book one of our 26 hotels in Milwaukee with 24-hour concierge service. That way you know help is always phone call or elevator ride away. Try Milwaukee Athletic Club. It's a 3.00 star rated hotel in Milwaukee that offers concierge services 24 hours a day. Try The Pfister Hotel. It's a 4.50 star rated hotel in Milwaukee that offers concierge services 24 hours a day. Try Hotel Metro. It's a 4.00 star rated hotel in Milwaukee that offers concierge services 24 hours a day. Try Ambassador Hotel - Milwaukee. It's a 4.00 star rated hotel in Milwaukee that offers concierge services 24 hours a day. This hotel has nightly rates as low as $134.00 per night. What about low rates on non-smoking hotels in Milwaukee? Super 8 by Wyndham Waukesha This hotel has a 2.00-star rating. La Quinta Inn & Suites Milwaukee Bayshore Area This hotel has a 3.00-star rating. The Park East Hotel This hotel has a 3.00-star rating. Best Western Plus Milwaukee Airport Hotel & Conference Ctr This hotel has a 3.00-star rating. What are the cheapest Milwaukee 3-star hotel deals? Our 3-star hotels bring you quality accommodations at a lower price point for the perfect, budget-friendly vacation in Milwaukee. With 66 3-star hotels throughout Milwaukee to choose from, you still have options. Browse our selection below. Hyatt Place Milwaukee Airport has rates as low as $110.00 per night. Situated near the airport, this hotel is 1.1 mi (1.8 km) from Mitchell Gallery of Flight and within 6 mi (10 km) of Alchemist Theater and Basilica of Saint Josaphat. Old South Side Settlement Museum and Alverno College Pitman Theatre are also within 6 mi (10 km). Best Western Plus Milwaukee Airport Hotel & Conference Ctr. This family-friendly Milwaukee hotel is located near the airport, 0.8 mi (1.3 km) from Mitchell Gallery of Flight, and within 6 mi (10 km) of Alchemist Theater and Old South Side Settlement Museum. Henry W. Maier Festival Park and SV Denis Sullivan are also within 9 mi (15 km). Hyatt Place Milwaukee West. Situated in the suburbs, this hotel is 2.7 mi (4.4 km) from Annunciation Greek Orthodox Church and within 6 mi (10 km) of Mayfair Mall and Harley Davidson Factory. Ray's MTB Indoor Mountain Bike Park and Eschweiler Buildings are also within 9 mi (15 km). 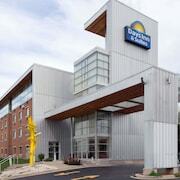 Days Inn & Suites by Wyndham Milwaukee has rates as low as $76.00 per night. Located in Downtown Milwaukee, this hotel is within 1 mi (2 km) of Milwaukee Youth Arts Center and BMO Harris Bradley Center. Milwaukee Art Museum and Charles Allis Art Museum are also within 3 mi (5 km). What are the best deals on 4-Star Hotels in Milwaukee? Milwaukee is full of hotels and it can be hard to narrow down where you really want to stay. Luckily, we've done that hard work for you be narrowing you from 185 hotels throughout Milwaukee, to the 15 4-star hotels in Milwaukee. Our 4-star hotels in Milwaukee are exactly what you need for your next family trip, romantic weekend, or solo getaway. Check out our most popular deals below. Hyatt Regency Milwaukee: This downtown Milwaukee hotel is located in the city’s bustling center, close to the Milwaukee River, one block from Bradly Center and Milwaukee Theatre, and linked via skywalk to shops on Grand Avenue and various restaurants. Potawatomi Hotel & Casino: Located in Downtown Milwaukee, this luxury hotel is within 1 mi (2 km) of Harley-Davidson Museum and Marquette University. Henry W. Maier Festival Park and Miller Park are also within 3 mi (5 km). The Pfister Hotel: Opened in 1893, this grand dame of Milwaukee is set in the financial district, 3 blocks from the Lake Michigan waterfront, and within 8 blocks of cultural, entertainment, and convention venues. Ambassador Hotel - Milwaukee: This restored 1920s Art Deco hotel, located in downtown Milwaukee, is 4 blocks from Marquette University, and near many conveniences, such as train and metro stations, shops, a ferry terminal, and a convention center. Find great deals on rooms starting as low as $134.00 per night. What are the best activities to do in Milwaukee? Milwaukee City Tour: Starting at just $40 per person. James Bond Escape Room Mission: Starting at just $32 per person. Mr. Dupree Escape Room Mission: Starting at just $32 per person. Dr. Kâ€™s Lethal Injection Escape Room Mission: Starting at just $37 per person. What are the most popular attractions in Milwaukee? People travel to Milwaukee from all around to witness the incredible sights and attractions. With 2 sights to see during your stay, you're sure to have a busy trip in Milwaukee. Below, we've listed some of our favorites. Everything was great except theres no breakfast no microwave and. Fridge like they promote!! It was very quiet. Staff reacted promptly to our requests. I liked the separate sitting area....didn’t have the bed to only sit on. Clean and has a park/ride to airport! Friendly staff! I liked the amenities the hotel offered, microwave, ironing board/iron, small fridge, hair dryer. Housekeeping did a great job when they came into the room while we were out so we came back to our room to our bed made up, trash taken out & clean towels. Most of all we never felt as if our belongings left in the room while we were out were being snooped through. But the biggest disappointment was NO CABLE/HBO...my husband & I couldn't relax & watch a good movie. Thank you for having a great continental breakfast, we were able to stop in the dining room early to get a quick hot bite to eat before our long day out & about. FYI...we live in Texas, when we stay in hotels here that have continental breakfasts the waffle iron makes TEXAS SHAPED WAFFLES, it be neat to stay in a hotel in Wisconsin that makes Wisconsin shaped waffles. Thank you super 8 for being a nice place to stay awsu from home. It was well kept, but the weather caused it to look dirty from the hidden trash in the snow & ground. The hotel is beautiful! The old world charm was beautiful. We had a great experience checking in with Jade, she was so friendly it really started our stay off right. We lived Miller Pub, everyone was nice and the cheese curds were great! We were woken up at 9:30am by someone I’m assuming from Housekeeping banging on our door. Originally it made me mad, but we didn’t put the do not disturb sign on the door, but still I wasn’t happy about it. The bed was very comfortable, only thing I would change about the room was the bathroom was very small. All in all a great stay!